The Palazzo Pio overlooks the small Piazza del Biscione and the larger Campo de’ Fiori. It is built upon the ruins of the Temple of Venus, which once crowned a theater complex built by Pompey the Great. Pompey is best known as a soldier and statesman, yet his most tangible legacy comes from his role as patron of an exceptional architectural and cultural creation, the design and construction of the very first permanent Roman theater. Plutarch records the spectacle staged on the occasion of its dedication in 55 B.C. In the Portico of Pompey, a covered area behind the theater designed for strolling between the acts of performances, Julius Caesar was assassinated on the Ides of March in 44 B.C. 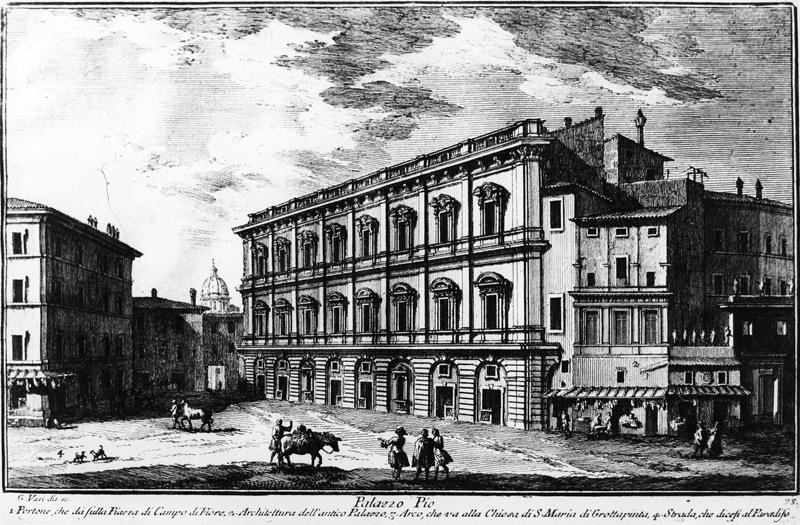 Palazzo Pio, etched by Giuseppe Vasi in his 1761 Guide to Rome. After the fall of Rome, Pompey’s theater continued to be used. It was repaired around 500 A.D. by Theodoric the Goth, but when dikes along the Tiber failed and squatters moved into the structure, it underwent further decline resulting from overuse, plundering and continuous habitation throughout the early Middle Ages. The temple was still in existence in the tenth century, but by the thirteenth the memory of the theater began to fade. It was then referred to as the “Temple of Pompey.” Historic documents show much confusion in the thirteenth century about the true nature of the structure. Later it became a fortified house for the Orsini family in their war with the Colonna family. Around 1450 Cardinal Francesco Condulmer, the nephew of Pope Eugene IV, bought a portion of the temple which corresponds to the space occupied by the current Palazzo Pio. Condulmer’s acquisition must have possessed the characteristics of a medieval family stronghold complete with a tower facing the adjacent Campo de’ Fiori. In the course of restoration work by the University of Washington, much of this thirteenth-century Orsini tower, long thought to have been demolished, was rediscovered. The Building eventually became known as the “Palazzo dell’Orologio”, because of the large clock (orologio) on the façade of the tower. As the Campo de’ Fiori emerged as a center of high culture during the Renaissance, the Orsini family commissioned Camillo Arcucci around the year 1650 to upgrade their medieval holdings. The baroque façade that we see today has its origins in that period. After the house was acquired by the princely Pio da Carpi di Savoia family it came to be known as the Palazzo Pio. In 1747 Giuseppe Vasi recorded it in his Magnificenze di Roma Antica, a picture book for tourists. Sometime in the mid-1800’s, the Pio family sold the palazzo to a banker who in turn passed it on to its current owners, Istituto Tata Giovanni, an ecclesiastical institution dedicated to the care of orphans. This charitable society used it through the 1920’s as a dormitory, classroom and workshop space for the orphaned boys of the institute. After the society reorganized and moved its activities, the third and fourth floors of the palazzo were eventually abandoned. For several decades, until the University of Washington restored them, these spaces remained unoccupied and in a state of disrepair.